James Hinds was born in Manchester in 1789 and joined the Royal Navy at the rank of “Boy” at age 10 in 1799. He initially served in HMS PHEASANT until about 1804, when at age 15 he transferred to the battleship of the line HMS SPARTIATE (74) in which he served at The Battle of Trafalgar on 21st October 1805. As he was only a young lad at the time of the battle, James was still alive and able to claim his medal in 1848 at the age of 59. The name of JAMES HINDS is totally unique on the entire NGS roll with no other claimants of that name. When James Hinds left the Royal Navy he is seen in 1816 marrying Ellen Smith on 12th September 1816 in Stoke on Trent. The marriage produced two sons, Frederic & James. 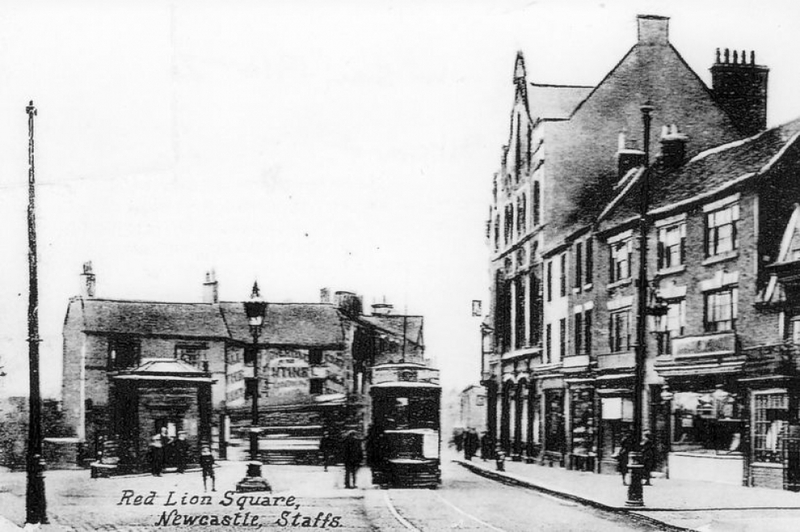 The family of four is then seen on the 1841 census, James senior as “innkeeper” living at Red Lion Square” (The Three Tuns Inn) in Newcastle under Lyme. The pub was originally a dwelling house constructed at the end of the reign of Elizabeth I around 1590 and had been renovated in the early 1800’s prior to the tenure of James Hinds. The Hinds family clearly prospered as they later became long time residents at a very upmarket address, “The Paddocks”, Thistleberry, Newcastle under Lyme, Staffordshire. 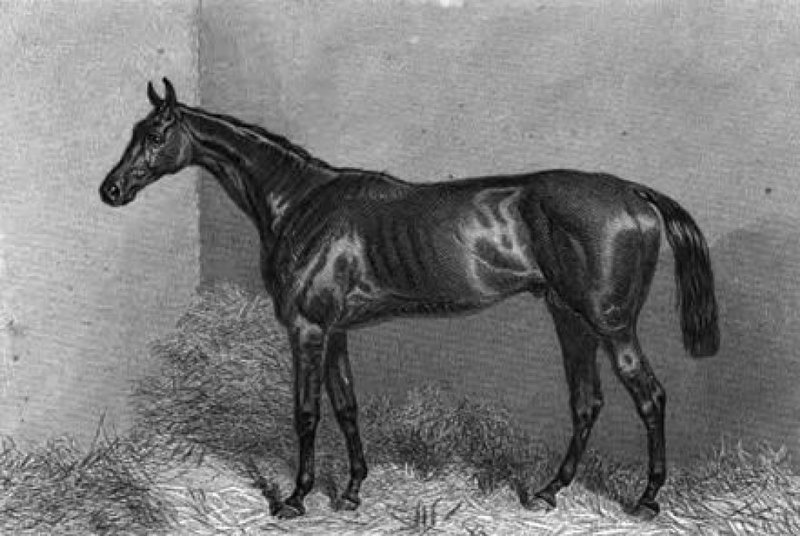 By the mid-1860’s, his younger son, James Alfred HINDS, who had clearly grown up in the pub trade with his father, became a wealthy Wines & Spirts dealer in his own right and later became a well known race horse breeder who bred a most famous race horse called “Lord Clifden” which won the 1863 St Ledger at Doncaster in a fabled, long remembered and spectacular finish. Father, James Hinds, the hero of Trafalgar, died at age 60 on 9th November 1849 and was buried on 11th November by the Rev, W.C. EVANS. This was just one year after making his claim for his NGS medal, so he almost certainly didn’t live to see or wear it.....hence it’s perfect state of preservation. 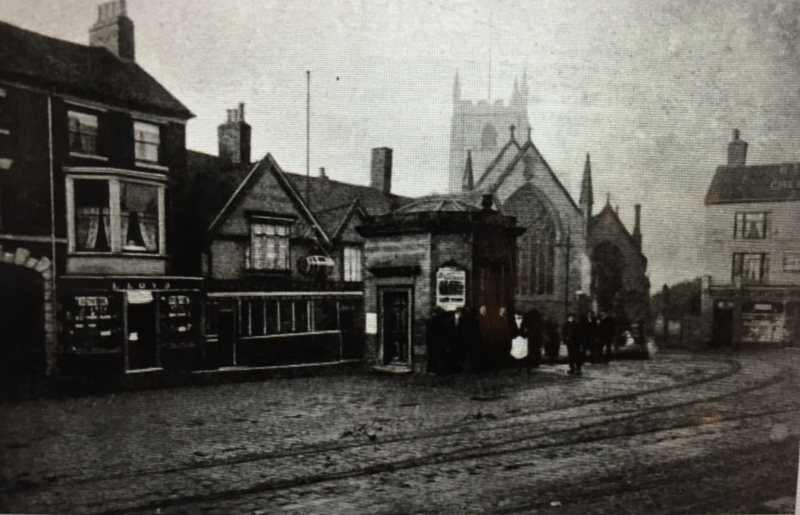 James’ Will was proved at Litchfield by his son James Alfred Hinds “wine and spirit merchant” on 18th December 1863 at “under £3000” in the county of Stafford records. 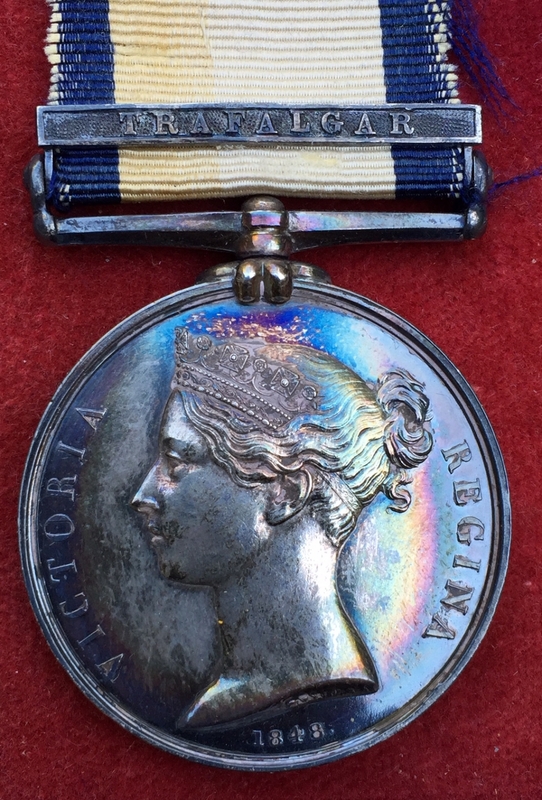 [A SUPERLATIVE EXAMPLE OF A RARE & DESIRABLE MEDAL] As the NGS medals were issued up to 57 years after the events they commemorated, the proud men who lived long enough to make a claim in 1848 had a comparatively short time during which to wear them. This factor has assisted in the preservation of many examples in fairly high grade, with the average grade of the surviving medals being GVF. The current medal is however a serious exception to that general rule. 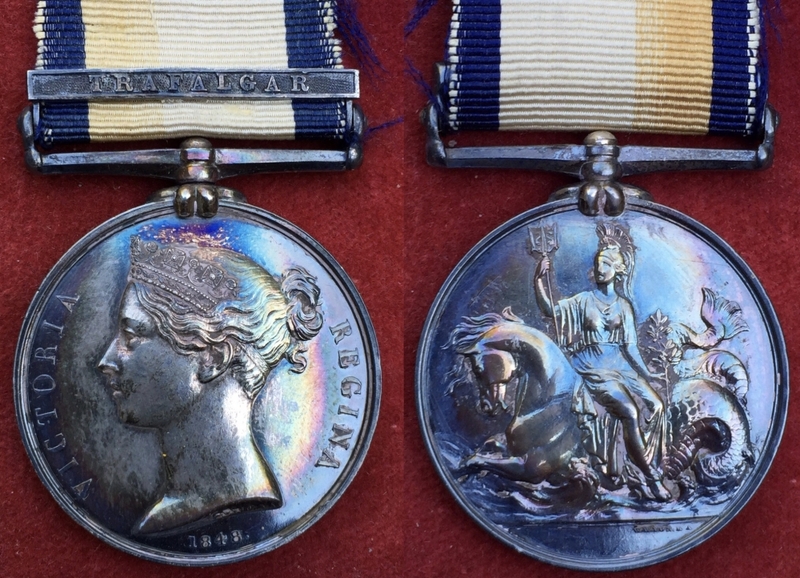 This medal has survived the 171 years since its issue in totally “Gem Mint State” condition. Not only is the medal practically “as struck”, with no trace of wear or friction, it also presents magnificent and totally proof-like surfaces on both its obverse and reverse fields. Overlaying these ultra choice surfaces, the medal displays an undisturbed, rare and naturally developed cobalt-electric blue flash with a russet and sea green patina mixed with multi coloured reflective highlights. In our opinion this medal is a unique survivor in this level of preservation. 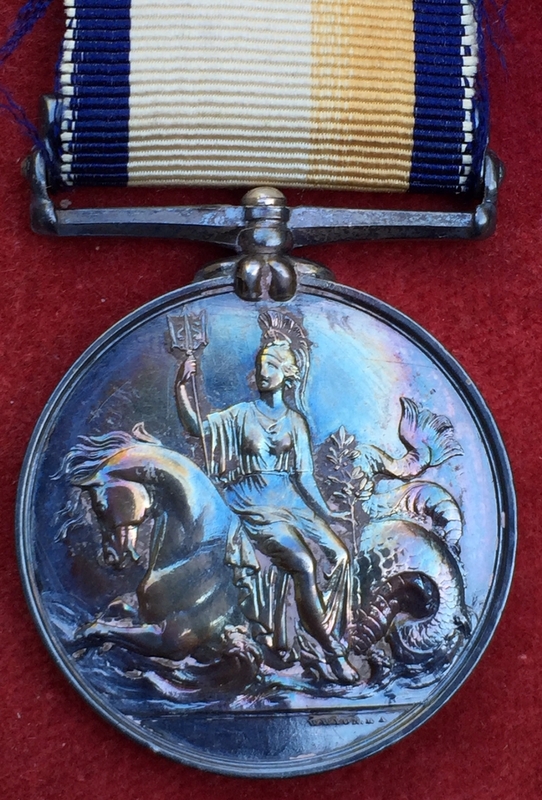 Frankly, in our own 43 years of full time immersion in the medal business we have never seen anything like it !......and it even retains its original ribbon. 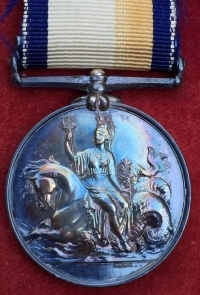 The Naval General Service medal was a retrospectively issued award made during the reign of Queen Victoria to men who had fought in naval actions from 1793 to 1840. The medal was only available to men who were still alive to make a claim in 1848. It was not claimable by families of men killed in action or since deceased. This precluded many tens of thousands of sailors who had already died and it became known as, The Dead Man’s Medal. The participating ships’ muster books confirm that 18,489 crewmen of all ranks fought at The Battle of Trafalgar, but by 1848-1851 only 1,710 (9.25%) of the then aged survivors were actually issued with the clasp....Thus 90.75% of the actual combatants were either killed during the battle, naturally deceased by 1848....or failed to claim at all. Of all the 230 different clasps made available to entitled and surviving seamen who were awarded the Naval General Service Medal, the most famous and popular is the clasp for TRAFALGAR. The clasp commemorates a man’s participation in the world’s most famous naval action, THE BATTLE OF TRAFALGAR, which took place on 21st October 1805 between the 33 ships of the combined French & Spanish fleets and the 27 ships of the British Royal Navy. 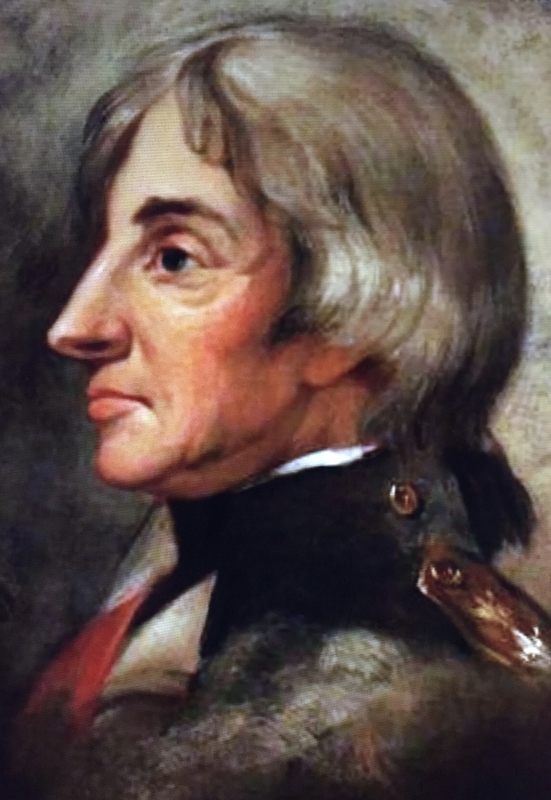 The result was a total victory for the Royal Navy Battle Fleet commanded by Admiral Horatio Nelson. 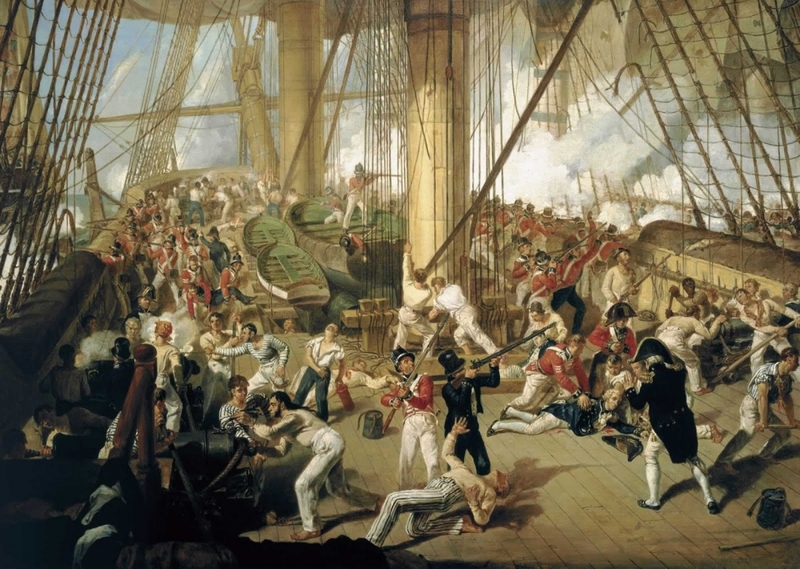 Sadly, at the climax of the battle, Nelson, while in clear sight and commanding HMS Victory from the quarter deck, was fatally hit in the spine by a sniper’s musket ball fired from high in the rigging of the French enemy ship Redoubtable. Admiral Nelson was taken below decks and tended by the surgeon and his fellow officers, including his close friend Captain Thomas Hardy. It was soon clear that he was in a terminal condition, and that nothing could be done for him. After a period of whispered conversation which consisted of questions and instructions by Nelson, he died. 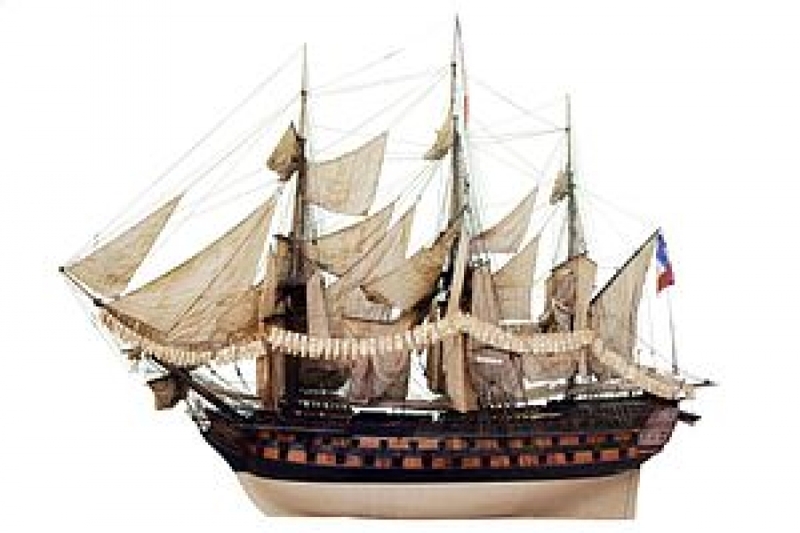 The Spartiate was a practically new ship which having been captured from the French by Admiral Nelson during the spectacularly successful Battle of the Nile, was quickly refitted and commissioned into the Royal Navy. At the Battle ofTrafalgar, HMS SPARTIATE (74) was Captained by Sir Francis Laforey, and was the tail ship in the northern Winward column. Along with the next ship in line ahead, HMS MINOTAUR (74) (Captain Charles Mansfield) the two captains together took on and destroyed the 80 gun enemy ship NEPTUNO. FIT FOR THE FINEST COLLECTION. IF YOU’ VE BEEN LOOKING FOR THAT REALLY SPECIAL TRAFALGAR NGS, THEN THIS IS IT !